Every so often, Museum staff gets an email or learns a story that connects the art in our collection with our community. These might be far-away communities, as in the case of the English ancestors of Miss Frances Lee, or it might be close by here in Milwaukee. Nana Kennedy is the subject of this painting by Lester Bentley, entitled “Nana” (fitting!). Nana grew up in Two Rivers, WI, and so did artist Lester Bentley. Bentley was good friends with Nana’s parents, and completed this painting as part of the Works Progress Administration (WPA), which was a New Deal program to employ millions of workers and artisans during the American Great Depression. After being separated for many years, Nana recently came to the Milwaukee Art Museum to visit her childhood portrait. Nana was 8 years old when Bentley painted her in 1939. When it was finished, he offered it to Nana’s parents for $25, but because of the Depression, they did not have the money to buy it. Luckily, though, this story has a happy ending. Nana was able to track the painting here to the Museum, where it now lives and is cared for as part of the art collection. But this story gets even more special. Since we have a very limited amount of space in the public galleries, occasionally Museum staff have works of art from the Collection hanging in their offices. This is how Nana came to preside over the office of Human Resources Associate Mary Beth Ribarchek–and how Mary Beth met Nana Kennedy. 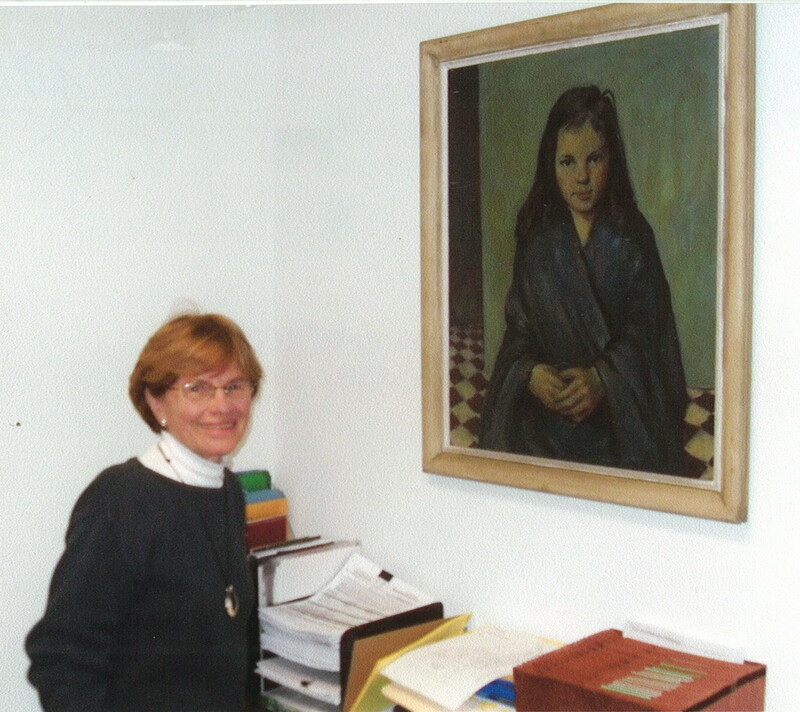 The Museum’s registrar brought Nana Kennedy into the offices to show her the painting, and Mary Beth was so excited to meet the now-grown-up girl in the painting in her office that she sent an email with this story out to all our staff. I have admired this painting, with its intentional green-blue hue and the figure’s piercing eyes, every time I visit Mary Beth. I was so thrilled to read the story and immediately approached everyone to be sure that we could share this story with all of you on the Blog. Many thanks go to Nana Kennedy, her family, Mary Beth, and our Registrar’s department for giving permission to post this story on our blog and give you a truly behind-the-scenes peek into how our collection’s history connects with Wisconsin today. This entry was posted in Art, Behind the Scenes and tagged Behind the Scenes, Milwaukee, painting, wisconsin, Works Progress Administration, Works Projects Administration. Bookmark the permalink. Such a beautiful painting, I can’t take my eyes off of it. I must get to your museum one of these days to check it out. Thanks for sharing. When talking about an art, it always triggers a happier feeling. To me art is just a synonym of beauty, and museum gallery is just a place to enjoy this beauty. Thanks for sharing this interesting info.